Also underneath the eyes I used BIG T & Sketch along with pencil liner in my lower line and gel eyeliner in my water line and just blended them out. I just want to say such a huge THANK YOU!! to everyone who commented my last post with such love and positivity. It really warms me && makes me feel good that theres so many wondeful females and males that have my back no matter how far. I appreciate each and everyone of you guys and I adore & love you lot soo much for that ( I'm no doubt sounding like a broken record now lol ). Gorgeous look. You look radiant, doll! I'm loving the all white background and clothing against your skin! lmfao; well Nick that is much appreciated. lol that's how makeup blogs got me feeling 24/7 so dangerous. oh yes that's a beautiful tropical look!! love this on u n that falsie looks good!! till this day i don't have electric eel. i feel like im the only loser w/out one =( .. this look just reminded me on how much i need to buy that e/s!! That's really cute I like. super cute look! you look so chipper, i love it. lala u got skils!! i loooove it mama!!!! i love this look! 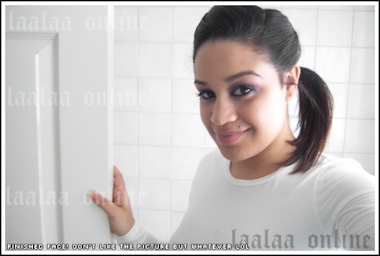 one of my best so far =] i like how its a realy good lighting tooo... was this in ur bathroom? i love the lighting!! nice combo tooo.. pretty lady!! love the eyelashes too.. wtheck.. i love it all!! ps I'm loving the new layout! your beautiful & your eyes loook greattt love it! thanks! i like yours too! looks fiercee! Wow check you! you look amazing! that makeup will look so hot with a lil black dress.. beautifully done! i absolutely love the pic of you hun..
your not alone. please never think that you are. this is so cute and you look beautiful in the first pic 2! Holy Crap! Now I'm going to need to hire you to be my MUA girl. You are looking amazing! And those lashes are perfection on ya. Great job hun!